I live in a very small town, called Saxapahaw. Pronounced SAX-pa-haw. I love living here. We don’t even have a stop light, and I mean that in a good way. We are, however, becoming a destination for lovers of art, farmers markets, good food and good wine. This year, our local winery, Benjamin Vineyards, is hosting its second annual Twelve Days of Christmas art show. Artists were invited to interpret one of the days mentioned in the song in any way they choose. I had hoped to participate last year, but the studio was still under construction and the Carolina Designer Craftsmen show was coming up fast. Even though we get the invitation in July, somehow the time evaporates. Due to the configuration of the winery, pieces that can be hung on the wall were preferred. I had an idea, but there would be some challenges. So I spent a lot of time figuring out how I would execute my plan. Here are some images of the piece, called “Rhythm Man,” resting on my work table. Sculpted but not dry yet. Later I will refine the beak. Can you guess which day it represents? There is a clue on the bird’s leg band. The biggest challenge was to make Rhythm Man as lightweight as possible, yet able to support the weight of the bird. The second biggest challenge was connecting the bird to the tree trunk securely. As you can see, there are only two contact points between the bird and the tree trunk–I could have had the beak touch the trunk, but wanted to portray the bird looking around–if you ever watch them (or find videos of them on the Internet), they tap on the tree for a while, then look around–it’s mesmerizing (or do I need to get out more???). Anyway, lucky for me that they brace themselves with their tails. To do this the tree started out as a solid log and the bird as two hollow pinch pots. As they firmed up, I carved out the tree, leaving shelves inside. Also, I cut the bird in half (that used to be painful for me, but I’m getting used to the idea of cutting open my work. I did apologize to the bird for the invasive procedure, but he’s better for it.) and hollowed it out as much as I dared. The piece is still heavy, but manageable. Below are images of the piece after underglazes and a little acrylic paint are applied. Rhythm Man, side view. You can see the ever-present Bodyguard in the background, in the process of receiving more layers of underglaze before she returns to the kiln. The little pieces of colorful ceramic are test tiles. You’ll see those blues in future posts! I was pleased with the result and dropped off the piece yesterday. At the winery, Nancy and Andy Zeman, owners, and Travis greeted me. They brought me to the wine tasting room, where I got to see several other pieces–very nice. Thirty-five artists, working in all mediums, will be represented. It’s going to be a wonderful show. The winery is open Thursday through Sunday, 12 Noon to 5PM. The Twelve Days of Christmas show runs from Nov. 5, 2009 through January 3, 2010. I didn’t have my camera with me, but can tell you the vines were beautiful–bright yellow leaves. FYI, the red bellied woodpecker is my husband’s favorite backyard bird. I’m partial to the white breasted nuthatch (so dapper in his little tuxedo) and Carolina wren. 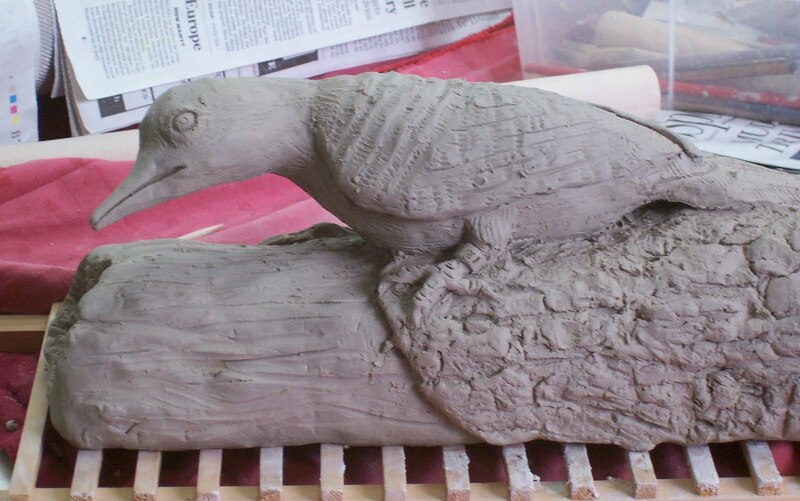 While looking for images on the Internet, I came across Vickie Henderson’s blog–she has posted an entry about the red bellied woodpecker after I sculpted the piece, but I was able to reference her images for glazing. 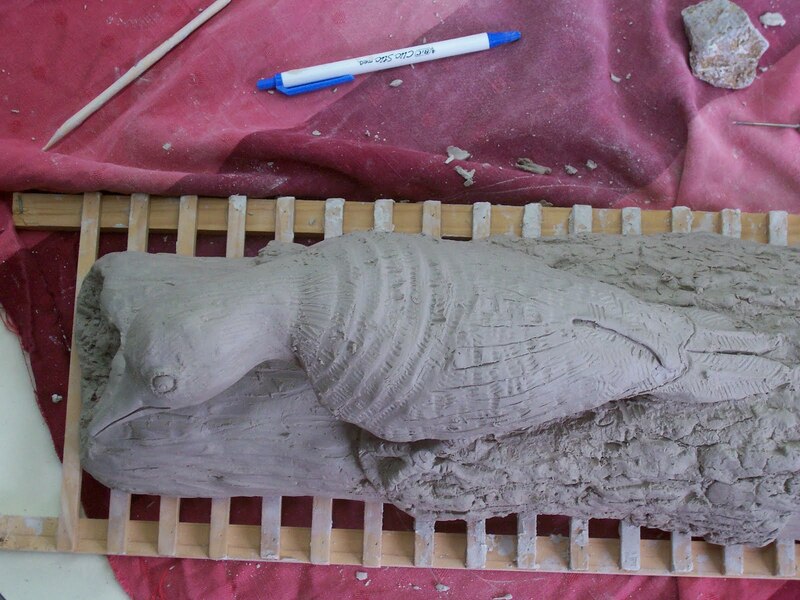 She has photos of the bird from many angles, which helps so much for 3-D work. As you can see, she has a post on the Carolina wren–I’ll be referencing that one someday, I’m sure. Thank you, Vickie! If you look at older posts on Vickie’s blog, there is a video of an adorable baby whooping crane and its family–you can see how nurturing and protective it parents are. It was so sweet, I had to watch it a couple of times!